This time next week the world's most energy efficient electric cars will be hitting speeds of up to 130 km/h (81 mph) as they race 3,000 km (1,865 Miles) coast to coast across the Australian Outback contesting the Bridgestone World Solar Challenge. The outright contenders for line honours will come from the big budget single seater aerodynamic vehicles of the Schneider Electric Challenger Class. The only external energy source allowed during the race is solar irradiation received by a maximum of either 3 square meters of high-efficiency (22.5%+), triple-junction gallium arsenide (GaAs) solar cells or 6 square meters of silicon based solar cells with less than 22.5% efficiency. The solar array is paired with a maximum on-board energy storage capacity of 5 kWh to assist with energy use strategy, hills, clouds or extra acceleration for overtaking. To have a good chance to win each car has to 1) Collect as much solar energy as possible and 2) Use as little energy as possible. This means special attention needs to be applied to the efficiency of transferring electrical energy to the wheels and minimising friction from aerodynamic drag and rolling resistance which is affected by vehicle weight amongst other things. To achieve the electrical efficiency goal, every Bridgestone World Solar Challenge winner since at least 1999 has used a direct drive in-wheel motor to propel the vehicle. Direct drive eliminates mechanical transmission losses that can be as much as 20%. Solar cars use very low rolling resistance tires that are specially designed for this race with a rolling resistance ten times less than an average road car. With the rolling resistance of a cars tyres accounting for roughly 20% of all energy used, tyres can account for up to one in every five tanks of fuel in a regular road car. Vehicle weight is also kept extremely low with extensive use of carbon fiber, again to minimise rolling resistance. In 2011 Tokai Challenger won with an average speed of 91.54 km/h (56 mph). With such high average speeds combined with the physics - air resistance being proportional to the square of speed - aerodynamic drag is the main source of losses on a solar race car. Much design effort is invested in CFD computer simulation, scale and full size wind tunnel testing. 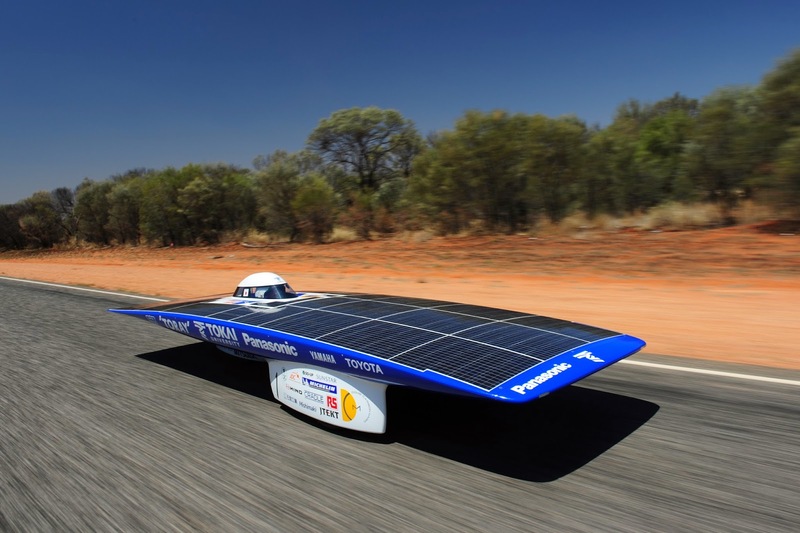 The best solar race cars achieve a drag coefficient as low as 0.07 (Nuna 3 – which holds the record for highest average winning speed @ 102.8 km/h) where a road car ranges from 0.24 (Tesla Model S) to 0.35 (Toyota Land Cruiser). It is the chase of maximum aerodynamic efficiency that has lead to the race winning dominance of “coffee table” type vehicle designs which brings up the question of how practical can a solar-powered vehicles be? The 2013 Bridgestone World Solar Challenge sees the introduction of the Michelin Cruiser Class which is not focused on speed but practicality, with the ultimate goal of entrants being able to meet the requirements for road registration. Cruiser Class cars must seat a minimum of two people and will be allowed over-night battery charging at select locations. While the Michelin cruiser class aligns solar race car design more closely with road car requirements, if the limitations of having the solar cells on the vehicle itself are removed, powering a regular road going EV with solar power is an affordable reality today! Tesla Motors recently launched a network of solar powered superchargers capable of charging their Model S to 320 km of range in 30 minutes. Even a modest 1.5 kw residential roof-top PV solar system generates enough energy to power a commuter EV like a Nissan Leaf for more than average annual mileage. In fact, displacing the cost of petrol instead of grid power will reduce the break even time on a roof-top PV installation from years to months.